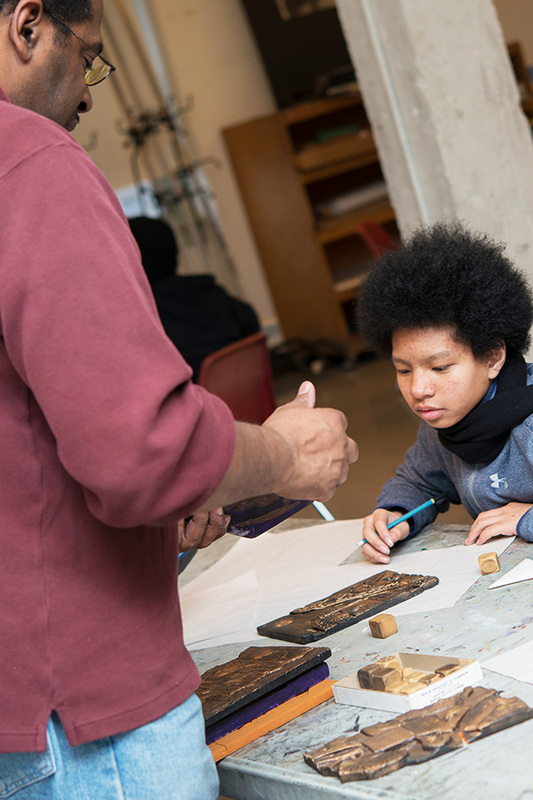 TWIGS offers free comprehensive training in the arts for Baltimore City children in grades 2-8, with exact age ranges varying from program to program. All classes are taught by professional working artists. Develop your talents in dance. Professional dance educators will train you in the basics of ballet. Classes will be held 1–4 times a week depending upon class level. In the spring, TWIGS dancers participate in an annual production. Dance is a program for students in grades 2-8. Improve on the instrument you now play. On Saturdays, you will participate in band, orchestra, or a group class; have a private lesson on your instrument; and take a musicianship class. We offer lessons in all orchestra and band instruments, i.e., string, woodwind, brass, percussion, as well as piano, guitar, and harp. Strings, piano, and harp lessons are for students in grades 2-8. All other lessons are for students in grades 5-8. Learn to sing and care for your voice. You will participate in a choral music program to work on components of singing including breath support, posture, note reading, and sound production. Vocal Music is a program for students in grades 6-8. Explore your imagination in acting classes and work with an ensemble in creative ways. Classes include improvisation, theatre games, and scene study. The 8th grade classes also include monologue rehearsal to develop audition material. Classes will be held once a week for one and one-half hours. Theatre is a program for students in grades 5-8. Learn a variety of stage design and production skills through puppetry art and literary theatre. Create puppets, scenery, props, costumes, and rehearse and perform your stories. Classes will be held once a week for one and one-half hours. Stage Design and Production is a program for students in grades 5-8. If you like to draw, paint, or work with your hands, we offer lessons with professional artists to develop skills in drawing, painting, and sculpture. Classes will be held once a week for two hours for 4th-7th graders and twice a week for two hours for 8th graders. Visual Arts is a program for students in grades 4-8. A movie is only as good as its story. Learn the principles of storytelling; how to find a story; and how to develop characters for film. You will complete a series of assignments that can be used for the high school audition for our newly established Film and Visual Storytelling Program. Writing exercises are essential to this class. Classes will meet once a week from October to January. Visual Storytelling is a program for students in grade 8. An invitation only, multi-departmental, multi-grade level course introducing students to various computer programs and elements including 3-D printing, video editing, and photography.